Ma. Didi spoke to the participants regarding the uniqueness of this course. It will not only give an opportunity for systematic study but also unfold the inner capacities or potentials of the practitioners and expand their outlook. It would give them an opportunity to come out of their individual shells and become a part of the society, understand their relationship with the society. 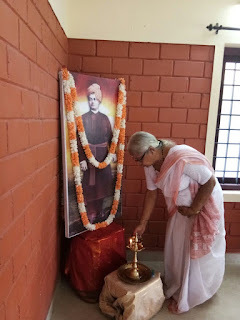 They were given a brief explanation about the 6 months course and introduced to the organizing team by the course coordinator Sri P.C.Sudhakaran, a close well-wisher of Vivekananda Kendra Vedic Vision Foundation. In connection with the U. B. 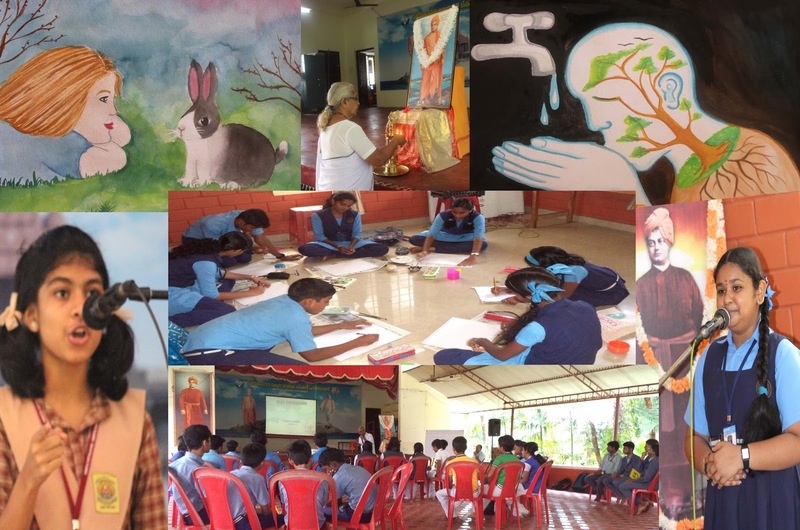 Day, a series of competitions for school students were held at Anandadham, after the Onam vacation on the 18th, 19th and 20th of September. 20 schools (CBSE and State board) were approached out of which 15 responded. 150 students took part in various competitions in the junior and senior level. On 18th September, there was painting competition for students from classes V to X. 40 children took part.The topic for the juniors was ' My beloved Pet' and for the seniors ' Water'. On 19th September, English and Malayalam elocution for the Junior and senior sections were conducted. 114 students were present to participate. On 20th September, two quiz contests were conducted.One for the high school level students, the topic for which was 'India's contribution to space science'. The second was for the Upper Primary level and the topic was 'Ramayana'. Seven schools were present for the quiz meant for seniors, whereas twelve schools were present for the junior quiz contest.Total 95 students participated. Concluding programme of UB Day celebration was on Wednesday, 27th September. 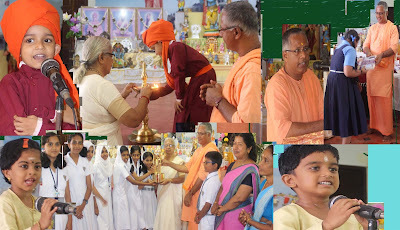 Srimad Swami Sadbhavanandaji, Mathadhyaksha of Ramakrishna Math Thrissur, was the Chief Guest.The programme included a short prayer by the UKG tiny-tots followed by a short speech by Master Ananthashree of UKG, dressed as 'Chicago Swamiji' from Kendra's balwadi-Sandeepani Sishuvihar; speeches of Swamiji recited in English and Malayalam by the prize winners of the elocution competitions held for the juniors and seniors on 18th September and Swamiji's quotations recited by the tiny tots of Sandeepani Sishuvihar. Revered Swami Sadbhavananda and Mananeeya Lakshmi Didi spoke to the children about the significance of Universal Brotherhood day.At the end, prizes were given away to the winners by the Chief Guest. This year, because of their excellent performance and total participation, students of SN Vidya Bhavan, Chentrapinni, were the winners of the rolling shields for both Malayalam and English elocution competitions.Hira School, Kaipamangalam from the junior group and SN Vidya Bhavan, Chentrapinni from the senior group were the first prize winners in Painting competitions.The group from Bharatiya Vidya Bhavan, Kodungallur were the winners of seniors Quiz contest and S N Vidyalayam were the winners from the junior group.